If he was in Nigeria, some people will say “respect your host”, others will say his father is from Cameroon, and some will say he can’t be trusted for whatever stupid reason. Nigeria is a sick country. Kelechi (Kacyee) Madu has won Edmonton-South West in tightly contested battleground. 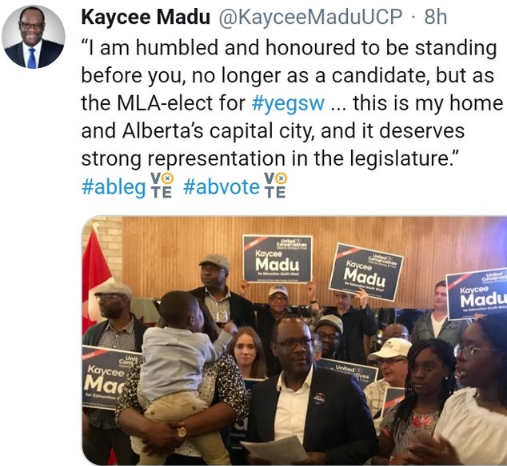 He made history by being the first African, Nigerian-Canadian to be elected as a Member of the Legislative Assembly of the Province of Alberta (MLA) in Canada’s history. 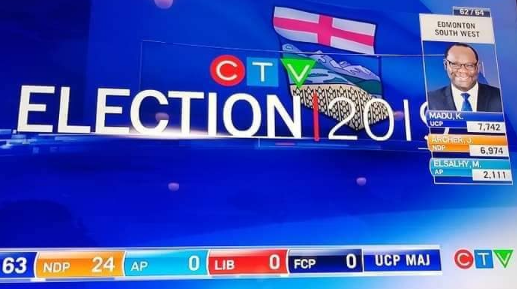 A candidate of United Conservative Party, Madu was declared the winner in Edmonton-South West in a close race against John Archer of the New Democrat Party with 62 of 64 polls reporting. Madu, 45, a Nigerian immigrant graduated with a Bachelor of Laws from the University of Lagos. He migrated to Canada in 2005 with his wife who enrolled in postgraduate studies at the University of Alberta. He is only UCP MLA in Edmonton. Congratulations!